One of the primary things to consider when buying or making a solar oven is; "what kind of foods are you planning to cook." This may seem obvious but it will have an effect on the ease of use, effectiveness and cooking results of different foods when using a particular style or kind of solar cooker. You can, of course cover all bases by building or purchasing one of each style of solar cooker,( as many people do) which would greatly increase your cooking capacity and reduce the length of cook time. You might ask yourself; am I mostly interested in baked goods such as breads, cakes, cookies etc., or do I want to do more of the high moisture content dishes such as soups, stews, chilies and meats that are ideal for slow, low temperature cooking, or do I want to be able to fry and grill some of my foods...or all of these? ...Most all of the solar cookers available in the three main classes can cook a large range of foods whether dry or moist, but some are more suited to specific kinds of foods than are others. A good sized box cooker is capable of baking foods on a tray/baking sheet and at the same time can cook together with a pot of fresh vegetables or a soup with the same satisfactory results. Note: Most traditional method cookbooks will state specific temperatures for baking cakes, pies or cookies.But you will soon find out that you can cook just fine; pretty much any kind of pastry, in a solar oven.The most notable difference will be the lengths of time due to a lower cooking temperature…remember it just takes longer using a solar cooker. …it is not always possible, nor is it necessary to maintain a cooking temperature of 300° F or higher in order to cook baked goods. Higher temperatures indicated in traditional cook books are designed more for convenience, (time) and for browning, crisping, or setting of cakes and pastries. Solar Box cookers will usually maintain cooking temperatures between 200° F up to 350° F., depending on the type of food being cooked. This style of solar cooker is also quite safe and usually requires very little supervision and guidance since it is difficult to burn or scorch the food. You can leave your cooking food unattended for longer periods of time when using this style of cooker because of greater heat retention and a diminished need to track the sun as often. Box cookers are generally considered more stable and less apt to tip over due to their normally larger base and weight. When they are well constructed with quality materials; they are usually more airtight and have a higher insulation rating, allowing for higher and more efficient cooking temperatures. 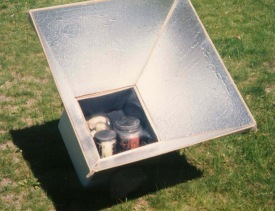 A solar panel cooker will usually consist of a pot/pan with a plastic or glass enclosure nestled into a; three up to five sided, reflective panel for better concentration of the suns rays. Most panel cookers are used for the cooking of foods with higher moisture content.Lower temperatures over longer periods of time tends to produce more succulent and moister foods with this style of slow cooking in the same way you would do so with a crockpot. But you can bake items in a panel cooker pot/pan, even though it is a little bit more challenging and restrictive with some items.A panel cooker will usually maintain cooking temperatures between 200° F to 250° F, which is more than sufficient for most all foods. This style of cooker will usually not reach the higher temperatures of a box or parabolic cooker due to it's reduced insulating capability which is usually only achieved by the use of a plastic or glass cover. A major plus when using a panel cooker is that, it does not require adjustment or alignment as often as say, a parabolic cooker. A major disadvantage is that wind can affect the cooking temperatures a little more than a box cooker and can grab the reflector panels like a sail on a boat,so it is necessary to anchor this cooker if there is a breeze. A solar panel cooker is also one of the easiest and least expensive to make using common materials found in the home or at a hardware store. Minimal ability and supervision is required to use a cooker of this style, and even some young children can be taught to safely use one. Remember also, it is quite difficult to burn or overcook food in this kind of cooker. 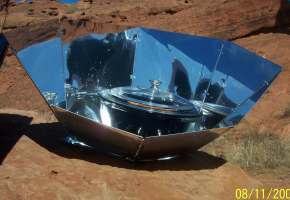 A Parabolic Solar Cooker is generally capable of maintaining higher cooking temperatures than a box or panel style cooker and therefore can be used for grilling and even frying. The single biggest drawback to a parabolic cooker is the need to adjust the angle and direction of the cooker more frequently (as compared to other styles of cookers) for maximum cooking efficiency. Comparatively, the amount of food that can be cooked at one time in a parabolic is less than in a box or panel cooker due to the size of the cooking pot or pan. But,because the parabolic can achieve higher temperatures, and do so more quickly, foods can be cooked quicker allowing for more individual meals to be cooked.This gives it a big plus in some peoples opinions. Due to higher temperatures and the more frequent need to adjust the cooker, a more experienced user/cook is recommended while cooking with a parabolic, as opposed to the lesser necessity with box or panel cookers. Do not let the uniqueness of a solar parabolic keep you from trying one of these cookers though. The skilled use of this cooker is easily achievable with a small amount of use and practice, and it will pay off with far larger benefits in the end. *Note: Our own children know how to safely use our parabolics. The second most common drawback to a parabolic cooker is the higher complexity in design and build.Many people have built very efficient and practical parabolic cookers from scratch using readily available materials, but most will admit they are more involved than other styles of solar cookers.These cookers are (usually) more expensive to make, and the commercially manufactured ones, though of high quality, are (usually) more expensive. 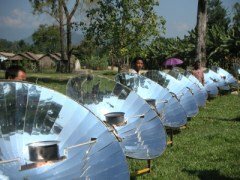 But, as is always the case, you can find some great, inexpensive models of parabolic cookers that will serve very well your solar cooking needs. Well built cookers of all classes and styles will usually last you for years, and will provide many delicious meals if they are taken care of and treated properly. See our video of all kinds of solar cookers cooking all kinds of food. Buy your own top of the line solar oven.